Holy ? @#% the first wallet bashing has occured! After re-checking the budget (cue sucking of teeth and visions of a bread and water diet for the next 12 months) I phoned Pilgrim and placed an order for the starter pack. I also took the opportunity to order a Granada donor pack while I was at it, so I'm looking forward to having an enormous collection of bits to play with in the not-too-distant future. Chassis build time is currently about 4 weeks and Pilgrim reckon it'll be 2 weeks before the donor pack is ready - I'm waiting to hear when I can go and get the donor bits and when they can deliver the chassis and starter pack. You may recall that I wasn't sure whether the donor pack is value for money - well, to be honest I'm still not, but I hope to be proved wrong shortly! The opinions I've heard on the subject have been mixed, some saying it was just as easy to strip my	own donor, some saying it saves the hassle of finding exactly all the	right pieces (since I need a few Sierra bits as well as the Granada ones). My view was swayed mostly by the time factor. Although I have been looking for donor cars every week in the local papers, Loot and Ad Trader, precious little seems to have come up unless I want to drive 70 miles to pick up an MoT failure, by which time I'm sure the cost/hassle savings would be very much negated. I'm sure I could easily spend another month trying to find something suitable, but my priority is getting this build going, not traipsing around scrap yards forever!! As a bonus, the donor pack comes with a V5 document which I think will save me some trouble later as well. I must just give a special mention to Tony Merrick from the Cobra Club who has kindly contacted me offering me support, some excellent tips and a peek at his build costs for his Sumo that he completed last April. I've budgeted for ~£12k and a 12 month build,	so I was very pleased to see Tony finished his in 13 months at a cost of £11,500. Makes me quite relieved to know that my expectations aren't unrealistic. On the subject of donor cars, Tony suggested that I try one of those "Guaranteed Finance" trade-in places as they often have cars that people have traded in that they can't sell on. Unfortunatly, it's too late for me now, but I mention it here in case anyone else needs inspiration. If you haven't noticed already, I've now added a guestbook to the site and sorted out a suitable email address for people to contact me. If you like the site or have some tips/stories you want to share or just want it to be known	that you stopped by please do sign the guestbook or drop me a line. I'd love to put some names to the webstats! 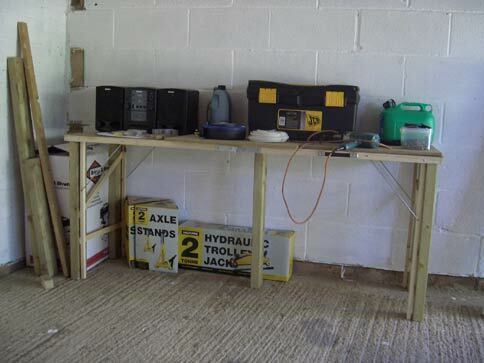 The garage/workshop is nearly ready. 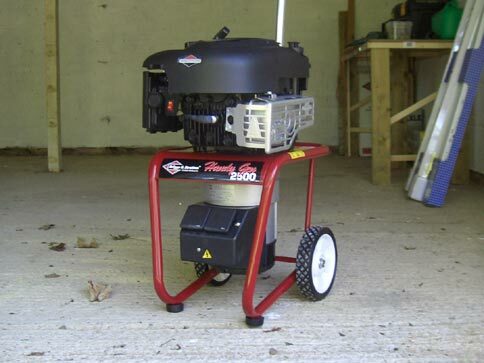 I've bought a generator from B&Q along with some strip lights and a workbench. The "workbench" actually started as a (very) cheap decorating table, but with some lateral thinking and some spare 2x4 I had it's turned into a pretty sturdy bit of furniture. I also popped into Halfords to buy an extra pair of axle stands (I already had one set) and a hydraulic jack in preparation for the chassis' arrival.